LOS ANGELES (November 28, 2018) – Just in time for the holiday travel rush, Buc-ee’s, Ltd., the Texas-based chain of travel centers that prides itself on its vast offerings and immaculate restrooms, will install Tooshlights®, the only smart restroom traffic management system that helps guests “know where to go.” Buc-ee’s will install the new system starting with its Katy and Temple locations in Texas. Each location boasts approximately 40 of their famous restrooms which will now become enhanced with the innovative Tooshlights technology. Tooshlights and Buc-cee’s share a common focus in improving public restrooms. 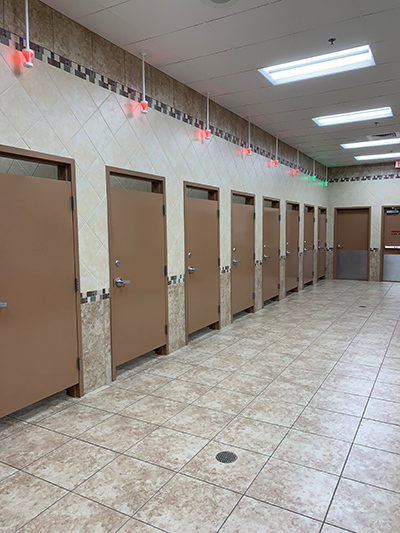 Tooshlights’ patented technology will improve upon an already incredible restroom stop experience for Buc-ee’s customers. Tooshlights is solving a massive pain point; reducing wait times, knowing where to go, and eliminating the awkward experience of having to peek under stalls to see if they are occupied. Each Tooshlights unit consists of a sleekly designed smart latch and indicator light. When the stall is available, the light is green. When the stall is occupied, and the smart latch activated, the light turns red. Tooshlights has also designed a new product specifically for the iconic travel center chain called “Smart Deadbolt”, a single door restroom unit that caters to businesses with single occupancy restrooms. The Tooshligths system will be installed in all 40 stalls in the Katy location and all 39 stalls in Temple. All new Buc-ee’s travel centers will have Tooshlights installed and other existing travel centers will be rolled out over the coming months. Buc-ee’s is an early investor in Modus Systems LLC. Tooshlights has also recently installed at Los Angeles International Airport, Hartsfield–Jackson Atlanta International Airport, Golden 1 Center (home of the Sacramento kings), and Westfield Topanga Mall in the Los Angeles area. Future installations Include Boston Logan Airport as well as a pilot at Dodger Stadium. The industry’s first-of-its-kind smart restroom solution helps venues and commercial spaces across the U.S. such as airports, arenas, stadiums, malls, hotels, convention centers, casinos, theme parks and office buildings enhance the guest experience and fundamentally improve traffic flow in public restrooms. Based in Los Angeles, Tooshlights® — powered by Modus Systems LLC — is the industry’s first and only automated LED lighting system that increases traffic flow in public restrooms by letting the guest “know where to go.” The patented, sleekly designed smart restroom solution is solving a massive pain point for consumers – privacy and long wait times. Tooshlights enhances the guest experience, helping to increase profits and eliminate awkwardness of people not knowing which stalls are open. The company’s patented technology also aims to better connect people with the spaces that they occupy through the use of real-time, venue-specific information. 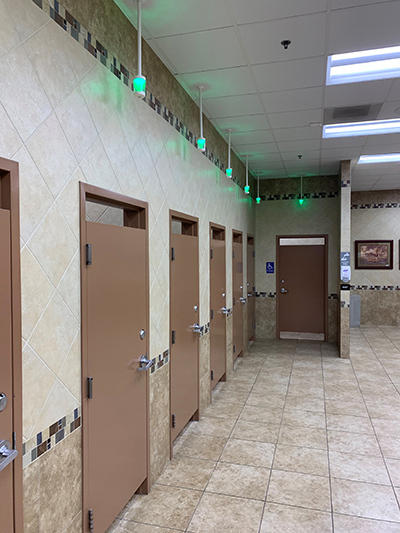 Tooshlights can dramatically improve restroom traffic flow of all types of commercial spaces such as, arenas, stadiums, airports, malls, hotels, convention centers, casinos, theme parks and office buildings. For more information, please visit www.tooshlights.com. Follow Tooshlights on Twitter @Tooshlights. 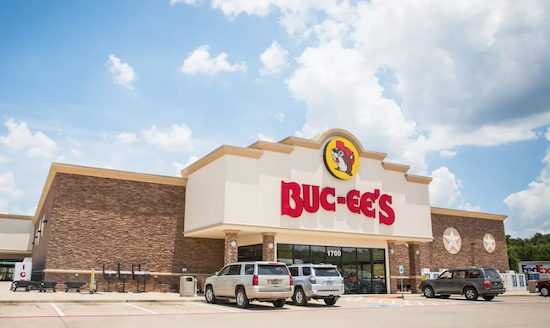 Founded in 1982, Buc-ee’s has 34 convenience stores and travel centers in Texas, with the first out-of-state location opening in Alabama in early 2019. Buc-ee’s is known for plentiful gas pumps, delicious, freshly made travel snacks, and award-winning clean restrooms. The company operates the largest convenience store in the world, located in New Braunfels, Texas. The New Braunfels Travel Center covers 68,000 square feet and features 120 fueling positions, 83 toilets, 31 cash registers 4 Icee machines, and 80 fountain dispensers. For more information, visit https://www.buc-ees.com.